We’re very pleased to be kicking off the official blog tour today for Midwinterblood by Marcus Sedgwick! From our rave review, you already know that the book is full of dark romance, mystery, and beauty, as well as moments that may send a quiet chill up your spine. As we were poking around doing research, however, we were somewhat surprised to find that Marcus actually does NOT write in a grim, dark cave with a single burning candle and he actually does NOT roam the English countryside wrapped up in long black cloaks. (I know, our jaws dropped, too.) Read on for a delightful conversation with one of the most fascinating guests we’ve ever had at The Midnight Garden. Many of your books are so dark, and the relationships so intense, yet your online personacomes across as very humorous and sunny. Do you need to put yourself in a certain mindset to write horror stories? That’s funny. :-) Yes I’m a happy person and have a good life and yet I do find that people expect me to be a total gloom-monger because of what I write! Ultimately, writing is no more than fiction, and I can’t stand people who get too pretentious about it. That’s not to say that I don’t take my work very seriously, but you don’t have to live the way your characters do. And you know it might sound weird to say but it’s actually a lot of fun sometimes when you’re dishing out the dark stuff. In a novel, I mean. Did you imagine any particular place/time for Blessed Island and its wretched inhabitants? Blessed Island is based VERY closely, in appearance at least, on the Swedish island of Brännöin the Gothenburg Archipelago. I was living there at the time I wrote the book and it was a biginfluence on the novel. Who would play your Eric and Merle in a film adaptation? I think a film adaption of this book is impossible, since Erik and Merleare a total of seven differentpeople each. That sort of thing can work in written form but itwould ask a lot of a cinema audienceto follow the changes in the protagonists through sevenincarnations. My film agent and others thinkit would be possible but I remain to be convinced! What kind of research did you do for Midwinterblood? This was a book with much less research than others I have written. There was some stuffabout orchids, and some stuff about the etymology of names and words. A little bit aboutthe painting (see below) and a wee bit about fighter planes. But overall much much lessthan a book like Revolver, which, although a very short book, took a very long time to research. From the author’s note, we’re told that the painting “Midvinterblot” referenced in thebook is a real work of art. What drew you to it, and how did this spark your idea for thisstory? I came across the painting by accident some years ago, and immediately knew I wanted to writea book ‘based’ on it. But I also immediately knew that I didn’t just want to tell the story of whatimagined was happening in the painting. It took four or five years, until I saw the painting again to come up with the idea of seven stories all about love and sacrifice and make the scene in thepainting the final one of those. Once I had that idea, the rest of the book came very quickly andafter a frantic bit of research I was away and writing quickly. Which is always a nice feeling foran author. The book is so intricately plotted, with so many connective threads that are both physicaland emotional. My immediate reaction after I finished the novel was “I must go back andreread this again!” How did you approach mapping something like this out? Did you startout with the idea of writing a generational story? I’ve answered some of that above: the idea of seven generations was the missing piece of the puzzle, and when I got that, it quickly led to the rest of the book appearing. 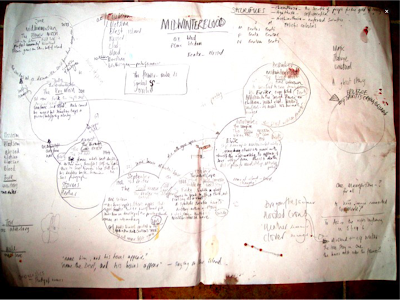 As for the plotting, itseems quite complicated, that’s true, but I did what I always do with my books; namely I made alarge map on big sheet of paper, mapping out each story and how they all interconnect. The idea of soul mates meeting again and again over time is certainly a romantic one, and I especially love that your star-crossed pair appear in different contexts with one another. Doyou believe in the idea of reincarnation yourself? No. I don’t think so. Although I find it wisest and easiest never to be too sure about anything. ;-)Slightly more seriously: for me the idea was not so much about reincarnation, but more about the other potential lives we might have lived; who else we might have been. How does Norse mythology figure in/influence Midwinterblood? It’s there but not in a massive way. The scene in the original painting “Midvinterblot” depicts thesacrifice of King Domaldr from pre-Christian Sweden: something that may or may not havehappened, but which informed the theme of the book, or one of them at least: sacrifice in all itsforms. The ending is just brutal. I read this several weeks ago, and it still haunts me. Have youever encountered resistance to your work? SPOILER WARNING: Skip over this answer if you haven‘t read the book yet.I’m surprised I don’t get more feedback of that sort: I think you’re right, it is brutal. But it kind ofhad to be like that. I actually wrote three endings for the book and my editor and I decided thatthey had to die: it’s the message of the book, and yet one that I hope is ultimately uplifting, thatalthough they die they are reunited in death. There’s also an implication that the whole cycle willstart again, on and on, through time, forever. Has your editor ever asked you to tone anything down? I occasionally have conversations with my editor about toning something down, but not thatoften. I don’t like to write out and out gore, but sometimes you do need a punch or two to makeyour point..
Why do you think readers, and perhaps children in particular, are drawn to horror? That’s a BIG question, one that it would take a book to answer properly. In fact I read a book onthat subject once, which suggested it’s because the centres for fear and pleasure are next to eachother in the brain… Who knows if that’s right, but it’s the name reason that most of us like to bescared witless on a roller coaster. It’s a safe kind of danger. None of us want to be scared for real,but we like it when it’s pretend: a horror film, a scary novel. It’s a fascinating issue. What’s the most memorable/touching/funny/weird encounter you’ve had with a fan? That’s a great question. There are a few lovely things that have happened; one was a boy whowrote to me about a younger series of books I write (The Raven Mysteries: UK only :-( but available online) who hadwritten and drawn his own version of one of my books. After a few emails I met him at a festivalevent and I decided to put the character he’d come up with into the final book in the series. Hewas really happy and so was I. Do you ever make it to the States for tours or speaking engagements? Yes, from time to time. Though not enough! I’m hoping to come out later this year if we canwork the timings to make sense. It’s a big trip but my girlfriend is from New York so we try andget back to see her mom from time to time. Ah, we’d love to see more of you here! I understand you worked in publishing in the UK before you became an author. I’mcurious how children’s publishing differs from the American market, and if you’d care toshare your thoughts on publishing trends in both countries. We definitelysee certain genres experiencing ebbs and flows inpopularity here in the U.S., and I wonder sometimes ifother markets are perhaps less influenced bycommercial demand. I’d love to tell you that that’s true, but I don’t think so. We seem to be just as driven by trends and fashions as the US market is, but I think it’s also true that in both markets there are the occasional brave publishers who find a book that’s a bit different and have the courage to publishit. That’s true of my UK publisher, Orion, and I think it’s true of my US one, Roaring Brook. It’s reassuring that someone’s still keen to find something new and different or we’d all get bored very quickly… That’s what gets missed by the the pressure to follow the trends: the fact that weneed an injection of something new from time to time to keep us all moving along, and findingnew things to fall in love with. We certainly don’t see too many stories like Midwinterblood written on this side of the pond for young adults; there’s a depth, complexity, and sophistication in it that is wonderful. We’re big fans of Macmillan/Roaring Brook Press as well, they’ve delivered some of the most unusual, daring YA novels in recent memory. Are there specific contemporary writers whose work you admire or would recommend,particularly for young adult readers? I’m a big fan of David Almond, Annabel Pitcher, Margo Lanagan and well too many more tomention. What future projects we can expect to see from you? We’re looking forward to hearing more about your future projects. Thanks so much for chatting with us, Marcus! It’s been a pleasure having you here. You’re welcome, some really cool questions, so thanks to you too! Marcus Sedgwick was born and raised in East Kent in the South-east of England. He nowdivides his time between a small village near Cambridge and the French Alps. 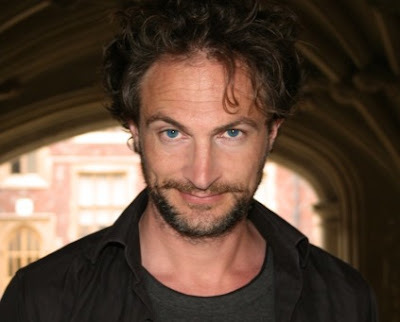 Alongside a 16 year career in publishing he established himself as a widely-admired writer ofYA fiction; he is the winner of many prizes, most notably the Branford-Boase Award for a debutnovel (Floodland), and the Booktrust Teenage Prize (My Swordhand is Singing). His books havebeen shortlisted for over thirty other awards, including the Carnegie Medal (four times), theEdgar Allan Poe Award (twice) and the Guardian Children’s Fiction Prize (four times). He is therecipient of a Printz Honor, for Revolver. Find Marcus online on his website, blog, Twitter, and Facebook. Check out the rest of the Midwinterblood Blog Tour stops, too! Win a copy of Midwinterblood! Thanks to our friends at Roaring Brook Press, we have a beautiful finished copy of Midwinterblood by Marcus Sedgwick to offer one of our lucky readers. All you need to do is fill out the Rafflecopter form (complete rules through the link) and leave a thoughtful comment below. Open to U.S. and Canadian residents aged 18 and over, or 13 and older with parental permission. Good luck! Midwinterblood is available in stores and online at Amazon and The Book Depository. Read our rave review published last week! Photographs courtesy of the author. Oh, I’ve been wanting to read this since last year when the Book Smugglers reviewed it! But it was super hard to get a copy, but now it looks like it’s more readily available! I’m in Austria right now, so I’m so happy it’s also available as an e-book! So all of the sudden I’m seeing this book EVERYWHERE! It sounds amazing and I’m a huge fan of horror so of course it’s on my must have list now! I haven’t read anything that sounded complex like this. I’m quite interested to get on with this! Got me sold on this book … putting it in my to-read folder on Goodreads! I’m always on the look out for new and interesting YA! This is definitely going on my To Read list! I’m always looking for new and awesome YA books. This is definitely going on my To Read list! Thanks for the giveaway, Wendy! I read your review of this book just a few days ago on Goodreads and immediately added it to my to-read. It looks so good. I’m always up for a quality YA story. I’m sorry, but I typed the same comment in two times because I couldn’t see it anywhere. My eyes apparently glazed over the “Your comment will be visible after approval”. Sorry again. I hope you don’t post both (no idea how this works..). Dark stories and based on a painting? I’m definitely in. The premise is fantastic and the review you guys did on this blog helped immensely. Thanks for the giveaway and I suppose I should check out his other books while I wait. Dark story and based on a painting? I’m in. Of course, the cool review of the book on this blog helped too. I’ll probably check out his other works while I wait! Woah this is so cool! I love the notebook! And that MAP. Omg, it’s too much. This book sounds amazing! This review was tantalizing. Seven characters, seven centuries, based on a painting he saw years ago. And I’m glad that he doesn’t write in a cave. He’s too adorable for that:) I can’t wait to read it!! Mostly dark, but yes, quite romantic in some ways, too. I’m glad you’ve seen good reviews, a book like this is always tricky. Ah, this is one that grabbed my attention a while back and I’d really love to get my hot little hands on a copy. SO GLAD to see that you enjoyed, Wendy. Really! Pick me! 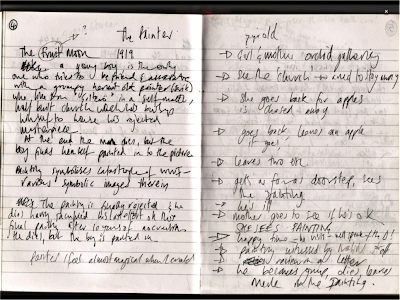 I am so thrilled that someone put up their notebook online so that we can see the writing process for a book. I have this on my wish list – I am so excited! I’ve seen a few writing notes, but this one was especially wonderful to peek into, in my opinion, Lyn. :) I hope you get your hands on this soon! I’m a huge fan of reincarnation stories when they’re done right, and I’m pretty open with the idea of star-crossed lovers thrown in there as well. If you love darker YA, look no further, Kyle. :) Since you enjoy reincarnation stories, I’d love to hear what you think when you get around to reading this. Wow! This book sounds fantastic!! Hope to read this one soon. This book fascinated me even more because of this review! I have never read a book that is “based” on a painting :)I am super excited to read this! I think the most useful interview make you want to read a book even more, so I’m glad we succeeded! Hooray for putting it on your TBR list. Great interview and review. A “dark” and “unsettling” book it right up my alley. Aw, yay! Thanks for letting me know the review and Q&A were helpful, Heather. This is such an unusual book, and definitely worth checking out if you’re curious. It won’t be to everyone’s taste, but oh my–if it is, it will blow your mind. Ooh! This sounds like the perfect book for me!!! I love a darker story than most do, so I think I would really appreciate that aspect. I also find myself making a plot sheet when I find myself getting lost during the crafting of a storyline or a geneological issue! I loved getting to see the author’s amazing plot sheet!!! Yeah, that plot map is one of my favorite things about this post, too. :) I also like the notes, where the last bullet point is “he dies,” hah. Apparently ALL the books are good, from the recommendations I’ve been bombarded with, Allison! I hope you enjoy when you get ahold of one of his books. Naughty! But something like that likely would have persuaded me to read a book if I were undecided, so I can see where you’re coming from. Definitely a book–and ending–you won’t forget. I love finding out the details on how a specific book came to be. This one sounds incredibly interesting with all the details and how everything is entwined. Definitely going on my TBR! I bet you’d LOVE this, Bonnie. Being a fan of dark books and gothic books and unconventional stories and all. The question is why wouldn’t I want to read this book. It sounds amazing! There’s no possible answer to that question! ;) It IS amazing. Oops, I seemed to have posted twice – I noticed after I used the wrong email to sign my comment. If you want to delete the above from “Admin”, that’s fine. Holy cow! Thanks so much for the promotion on this book, because it slipped under my radar and now I’m dying to read it. Dark YA fantasy is my JAM. I’m glad you saw our giveaway, Logan! Dark YA is hard to find, but when you come across it…bliss. This sounds pretty good! And actual dark YA isn’t as easy to find as it might seem! After Quicksilver, it’s my favorite read of 2012 so far, Lexxie! And that’s not nearly as silly as it sounds, I’ve already read 27 books this year, hah. Yep, my jaw dropped…I totally expected him to skulk around in a dark cloak. :) Love this interview! And I love how he says it’s not about reincarnation so much as the lives we might have lead, had we made some different choices. I’m reading Pivot Point right now, and it’s making me think about this same thing. Ah, this interview is so inspiring! I own two of Sedgwick’s books, but still haven’t read anything by him, and I think this is the post that will push one of his books to the top of the TBR pile! Also, it’s made me think a lot about my own process as a writer. I love reading about how published authors work, it’s so motivating. Ohh Jess, you must read them! I think, I hope, that you’ll enjoy. His writing is so unusual and complex, I think you’ll find how he crafts his novels to be very inspiring. AND then if all the horror novelists got together wearing their black cloaks and sat at long tables chanting…. I think that theory about horror being appealing because fear and pleasure centers being close together in the brain is pretty interesting, too. Food for thought. I’m excited to read this book because…well…because it’s Marcus Sedgwick! Yes please. I’ve read….a whole bunch of his books and he always ties characters and plot and creepiness together so seamlessly and smoothly. Marcus seems like an interesting, entertaining, and very cool person. Thanks for the insightful interview! He’s one of those gents who would be fun to go to a pub with, I think. ;) Thanks for stopping by, Andrea! “we were somewhat surprised to find that Marcus actually does NOT write in a grim, dark cave with a single burning candle and he actually does NOT roam the English countryside wrapped up in long black cloaks” LOL. I always enjoy your interviews, Wendy. I’ve seen this book around but wasn’t sure if it was in my reading niche. But the interview sold me, I’ll give any book a chance if it has an author with a great personality any day. Hah, thank you! And I’m glad the interview sold you. The conversation with the author is but just a small glimpse of the wonder that his books contain, so I very much hope you enjoy MIDWINTERBLOOD. I love the interview and ADORE the pictures! I’m a sucker for pictures and they’re so cool! Glad you enjoyed, Sunny. I’m so pleased he had photographs to share with us! I love this interview! Some sick part of me just can’t get enough of how author’s minds work–particularly those who write creepy stuff. I’m a bit put out about the lack of cloak in general, but I did get to nerd out over the notebook pictures. LOVE the story about his fan, also insanely excited about his deal with First Second. There’s a graphic novel I can’t wait for! I think it’s hilarious that the two of us love Laura Ingalls Wilder and have had many discussions about lovely farms, but you’re also my buddy who likes I HUNT KILLERS and dark material like this! I am right there with you with the desire to delve deep into this stuff. Although I am disappointed about that cloak, too. What a great interview! Thanks for introducing this gem, Wendy. I tend to agree with Sedgwick’s answer regarding why readers are drawn to horror. I’m just a casual horror reader but you do make this one sound enticing. Can’t wait to hear more about Sedgwick’s next YA book. There are some horror books I really enjoy, Lucy, but they tend to be the ones that capture my imagination rather than being just out and out gore. This one has bloodshed for sure, but the real tragedy and real horror is what the story makes you feel for its characters. Soulmates meeting again and again got me SOLD! thanks for the interview! So interesting to learn so much about the map and the notes. This is another one that’s on my rdar due to Wendy’s reviews. I love that she brings all kinds of books outside my normal genres to my attention. Anyway – I have to say I love that this is based on a real painting – it made me curious enough to google Midvinterblot and see what I could find. An interesting inspiration and one that has me even more curious about the book! Yay! I find much more satisfaction in spotlighting a book some readers may not have heard of rather than confirming or denying an opinion about a popular book, Jessie, so thank you for that. :) Not that I don’t love my bestsellers too, these are just particularly exciting to talk about! I hope you enjoy this when you get ahold of it. It’s such a fascinating read. That little boy must have been SO thrilled! I would have been, hah. And thank you, Sara! It helps to have such a lovely and gracious guest, too. I do love this interview. I think my favourite questions touched on the horror and the brain having the excitement and fear part close together so we find them equally enjoyable. Quite an interesting thought. I liked the point about his picture too and the creation of the seven worlds eventually from the painting. I like the look. 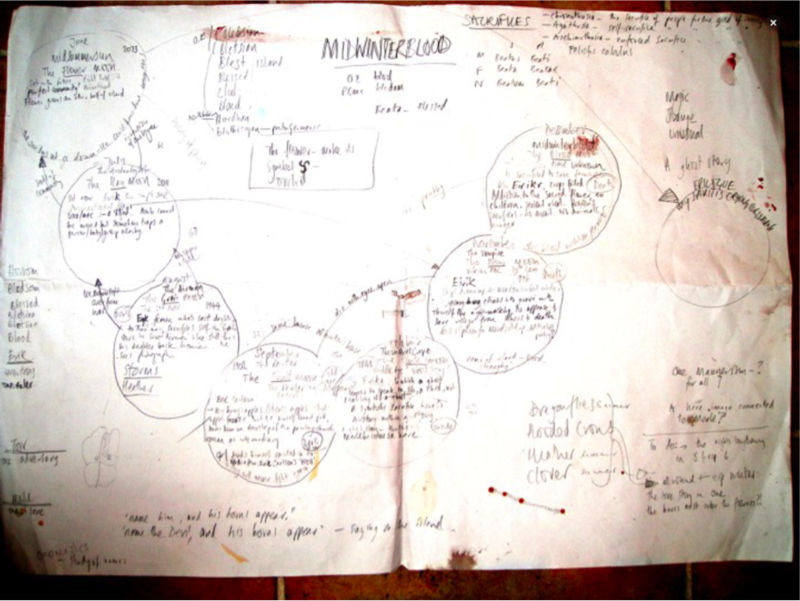 And then his pictures, wow, that handwriting. haha. Still a very awesome interview, with some really different questions that dragged a lot of juice from this guy. I thought that was such an interesting insight too, Livvy. It’s so interesting to see what different readers respond to horror-wise, too. I hope you get a chance to read this soon! I’ve been following your tweets about Midwinterblood. It sounds amazing. I’ll definitely be adding this to my TBR list. I’m so glad you’re going to try to check this out, Karen! Definitely not a book for everybody, but such a rewarding read for those who like his writing style or want to try something a little different. A graphic novel by Marcus Sedgwick!? *fans self* That’s soooo exciting! III know! It’d be cool to see one of his books illustrated by the author himself sometime, too. What a great interview!! I love that painting. I think it’s really cool that Blessed Island is based a lot on where he was living at the time. I am only through the first part in this book, but I am enjoying it!! Yeah, funnily enough I’d asked Marcus for a photo of his writing space, which is a really sweet little painted shed tucked away in his back yard…but I didn’t end up using it since he wrote this particular book on an island, hah. I’m so glad you’re enjoying the book so far, Amy! This book really sounds interesting. I’ll have to add it to the to-read list. Great interview! This wasn’t on my radar until your review, but I’m definitely going to check it out. I love hearing about the creative process — loved the peek into his notebook and seeing the painting that inspired the story! 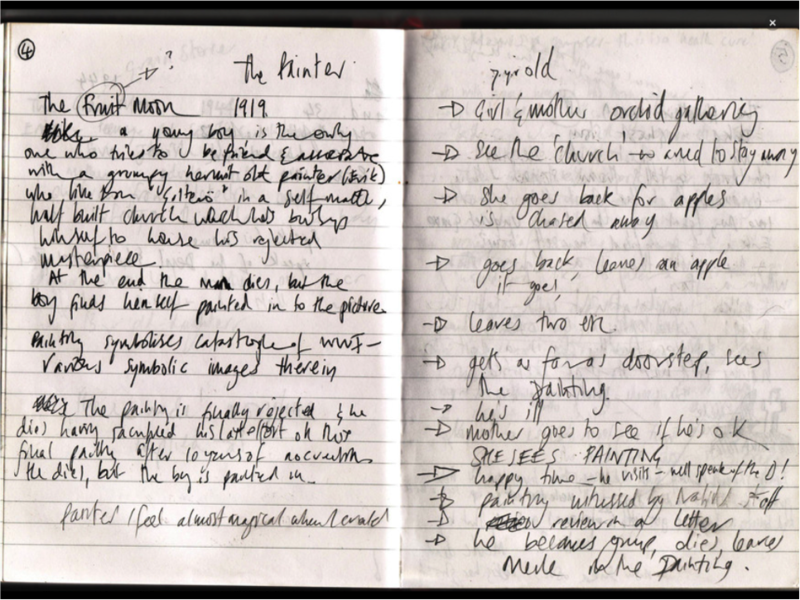 I love love love seeing author/artist notes too, Jen–they often give you such a telling look at the creative process. Marcus is apparently an illustrator and musician as well, so I’m sure the contents of his notebooks as a whole are fascinating. Oh man, if you’re a horror fan I am pretty sure you’d like this, Tammy. It’s the more subtle type of horror, but his books still make the hair raise on the back of my neck nonetheless. This is so awesome that a beautiful painting inspired a whole novel! Love art, so it’s a wonderful blending of two crafts:) The story sounds so creepy too! It’s a very strange but beautiful painting, isn’t it? Not unlike the book, actually. :) I hope you enjoy the book when you get around to reading it, Christina. THanks for the awesome interview! This book sounds very intriguing :) Definitely going to go check it out. I’m going to read this because you told me to. ;) I’m super excited for it now! This interview has convinced me that it is a winner. Hah hah, yes I have been telling you EVERYWHERE THAT I AM IN CONTACT WITH YOU that you’d love this book. But really, I think you will. :) Fingers crossed I’m right! Fabulous questions!!! I thought this book was such a unique and beautifully written story. I enjoyed your review, Kate! I’m looking forward to your tour stop tomorrow, too. I love that he was inspired by a painting, which took him down such a dark path. And that plot sheet! You can tell he definitely referenced it multiple times, based on the creasing and stains. Fab interview! It’s always fascinating to me to hear about inspirations behind a project, especially an unusual book like this one! I was so tickled he was able to share his notes and “book map,” too. I’m glad you enjoyed the interview! I want to read this so much! Darker YA based on a beautiful painting? Sounds perfect. The promise of star-crossed lovers and a shocking ending is enticing too. There isn’t another YA book like it as far as I know, Jill. So unusual, and beautiful and brutal all at once.